Grab the wool socks and put a log on the fireplace! It’s time to cozy up to some cool weather comfort food like roasted pumpkin and garlic pasta and enjoy the season! Autumn has really allowed us to ease into cooler weather this year with unseasonably warm temperatures (for Michigan! ), and I think I am ready for a little fall! I won’t spend a much time taunting you with explaining much about this drool worthy dinner, but I did want to give you a few swaps and examples for how to use the roasted garlic pumpkin cream sauce, as well as some swaps for the pasta if you are a home that can’t do that! I want everyone to be able to enjoy this dish! This sauce….oh the creaminess and flavor! You can’t get the depth of roasted flavor from canned pumpkin or a powdered garlic…I promise you will be blown away if you just use the good stuff! 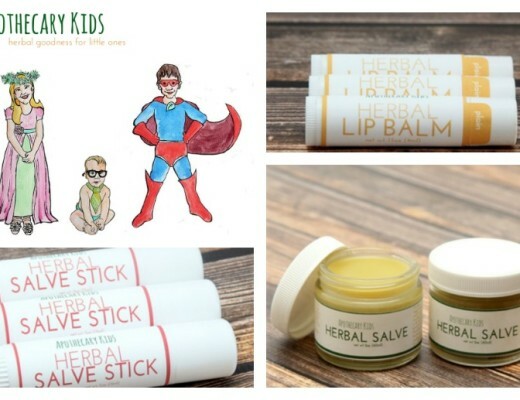 It will quickly become a family favorite which is why I want to offer a few swaps for those that need it! First, if you are a dairy free home, I have made this with all coconut milk and it is so amazing. I am not a huge fan of things tasting like coconut, and I think the roasted pumpkin and garlic take over the flavor of the dish very well. I also have done half coconut milk and half water and it is still really amazing. I use the Tinkyada brand rice noodles pretty exclusively for pasta needs in our house, but use whatever you have on hand or like to use. If you are a grain free home, or pasta isn’t in the house, this cream sauce is good on….just about everything! You can make veggie noodles with your spirilizer such as sweet potato noodles or “zoodles” with zucchini. Or you can make a big veggie stir fry and mix the meatballs in along with the cream sauce. Whatever you can swing…try it! This sauce is just decadent! 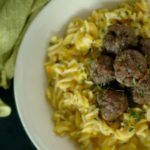 A note on the meatballs! 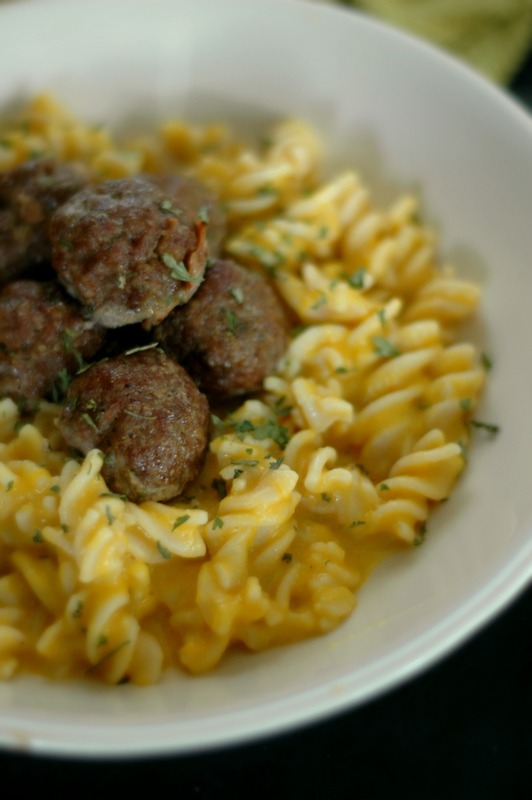 The egg in the meatballs is for binding, so if you are an egg free home simply use a gelatin or flax egg and you should be just fine. I think tapioca flour would be a good swap if you are grain free. Dear friends, this is how we welcome in fall around here! Happy autumn season to you! Start with roasting the pumpkin and garlic. Halve the pumpkin and scoop out the seeds. Place the pumpkin halves flesh side up on a baking sheet, and spread 2 TB of butter over the flesh of the pumpkins, then sprinkle sea salt and pepper. Roast at 425 degrees for 45-50 minutes until the flesh is soft. Put the garlic cloves on the baking sheet for the last 15-20 minutes to roast as well. 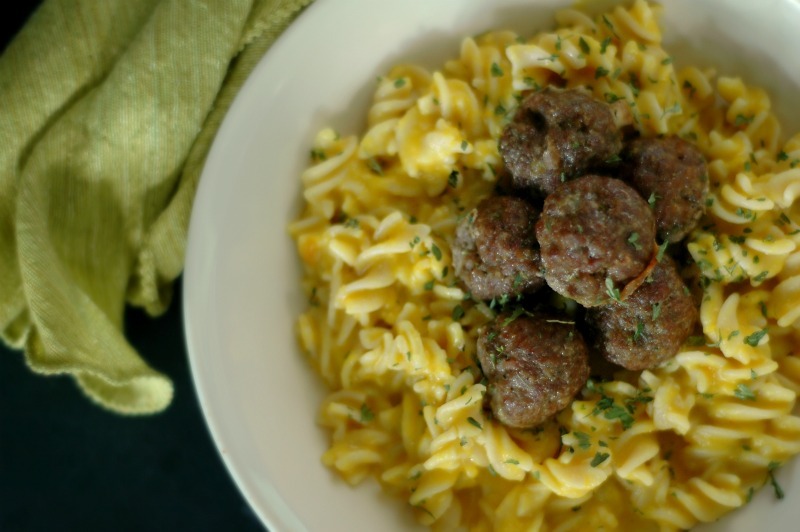 While the pumpkins are roasting, you can make the meatballs. Put all of the meatball ingredients in a small mixing bowl and combine. Roll the meatball mixture into small, 2 inch meatballs and place on a Silpat or parchment paper lined baking sheet. You can bake the meatballs along with the pumpkin at 425 degrees for about 15-20 minutes (I like to put them in the same time as I put the garlic in). Once the pumpkins and garlic are done roasting and cool enough to touch, scoop the flesh of the pumpkin into a food processor or blender and squeeze the roasted garlic in. Blend the pumpkin and garlic until smooth. 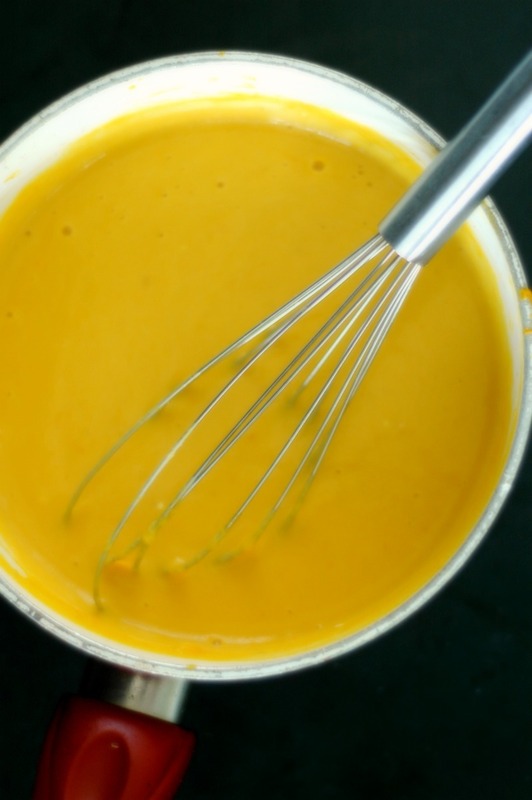 Put the pumpkin and garlic puree into a sauce pan along with 2 TB of butter and the milk and warm to a low simmer. Whisk until smooth (you can add more liquid here if you wish for a thinner sauce). Turn off the heat and whisk in the sour cream, and then sea salt and pepper to taste. 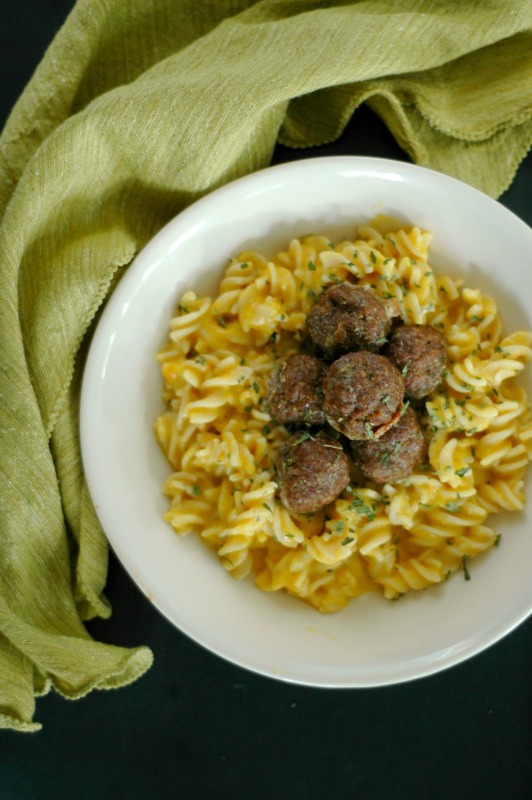 Toss the cooked pasta with the roasted pumpkin and garlic cream sauce and top with your sage & thyme meatballs. Garnish with sage and parsley. 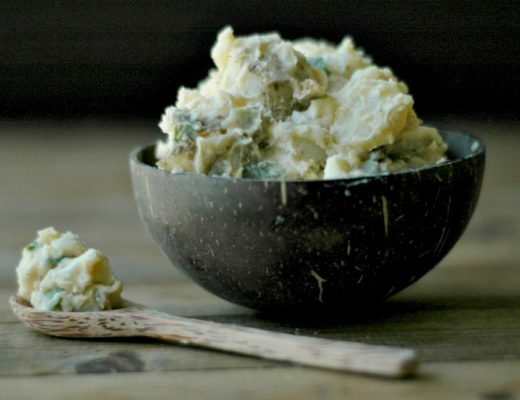 Healthy Instant Pot Potato Salad :: Gluten Free, Dairy Free, & Paleo Friendly! Let me know how the family likes it Amy! Beautiful Renee! Such creamy oodness. Pinning and sharing. Renee, I am going to dream about that saucepan of roasted pumpkin and garlic sauce. That is the stuff of dreams. I must make it for my fam!!! SWOON. Thank you for the lovely recipe! Megan! I love it! Enjoy it! This sauce looks amazing! And I was just wondering what I was going to do with the pumpkin I just impulse bought – comforting pasta to the rescue! Found this recipe through the Yummly app, going to be cooking it tonight! Will let you know how it goes, going to give it a go with spiralised sweet potato noodles. Thanks! This sounds amazing! Unfortunately our farm share doesn’t have pumpkins anymore. Could this be made with a winter squash instead? I’ve never cooked pumpkin so I’m not sure how similar it is. Thanks! Hi Kristy! Yes a winter squash such as butternut or acorn would work great! I think the only one that wouldn’t work well would be a spaghetti squash. I hope that helps! How much pumpkin purée if not using a whole pie pumpkin?